Make to any size - sample was lapghan size 36" x 48"
Pure crocheted decadence! Perfect for any chocolate lover! dark brown and oatmeal – approx. 1312 yards each color. You might also try using a single strand of a variegated aran weight yarn. A bulky yarn could also work well, but you might want to go up a hook size if using a heavier yarn. The pattern is written so you may make the blanket to any size. Sample blanket was 36” x 48”. 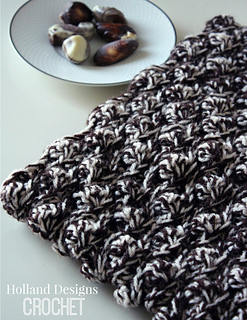 You can also use this same pattern to create a chocolate sea shell scarf!